Our beautiful sheepskin boots and slippers for women draw inspiration from the rugged and tough but always outstanding Australian landscape, and even more so with our Australian Made selection. Choose from classic EMU Australia boots in a variety of heights, such as tall, mid-calf and ankle length, in timeless colors including tan, brown and black. 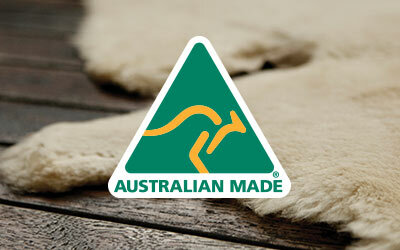 We also have 100% real Australian sheepskin and Australian Made slippers, available in gray, tan, black and brown. When we first created our classic and original sheepskin boots, we wanted to embody the spirit of the naturally beautiful landscape of Australia, so we only use the best quality, natural materials, such as 100% real Australian sheepskin and merino wool. Our Australian Made selection of course reflects this even more so. Our signature EMU Australia classic sheepskin boots and slippers are Australian Made, and you can choose from our signature boots in a variety of heights and colors. Or opt for our cozy sheepskin slippers in both mule and bootie style, with luxurious fluffy outer cuffs to keep your feet warm in your home. 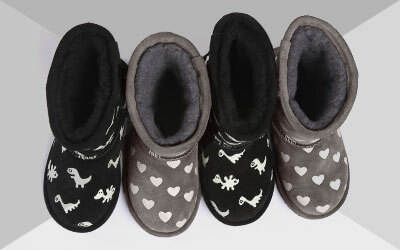 Our slippers are also durable enough to be worn outside in both the cold winter and warmer summers. All of our sheepskin boots and slippers, including our Australian Made range, can be worn year-round thanks to our 100% real Australian sheepskin. 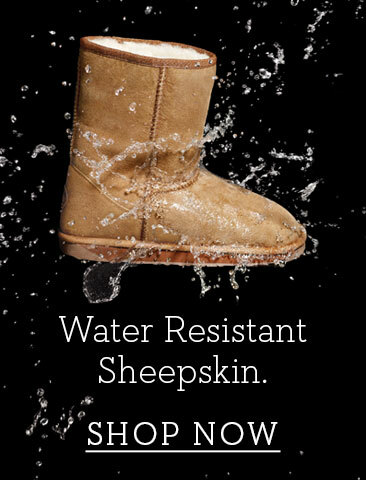 It’s water resistant and a really breathable material, so your feet will stay dry and cool in warmer weather and warm and toasty when the snow and ice of winter returns. Our Australian Made boots and slippers are also ideal for travel, since they slip on and off with ease, so great for wearing on long travel days and through the airport. Our EMU Australian Made sheepskin boots and slippers are warm, comfortable, and cozy, whilst remaining ultra stylish and fashionable. Our Australian Made sheepskin boots and slippers are soft and light, but are also super durable and long lasting, since we only use the best quality materials. The soles are hard wearing but flexible and anatomically designed, so if you’re wearing our sheepskin boots for long periods of time you’re feet will remain completely comfortable and cool all day. The seams are of superior quality as they’re double stitched, making a pair of EMU Australian Made sheepskin boots or slippers a very sound investment for your feet that will last for years and years.